Lydia was a country in Asia Minor wile the region was known as Anatolia. The Greeks and Persians probably fought some battles here as well as in the Mediterranean Sea. 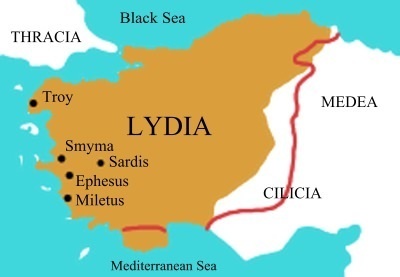 The seven churches in Revelation 1 through 3, Ephesus, Smyrna, Pergamum, Thyatira, Sardis, Philadelphia and Laodicea were in the region of Lydia. Lydia was in modern day Turkey and is known for being the origin of modern coin currency.